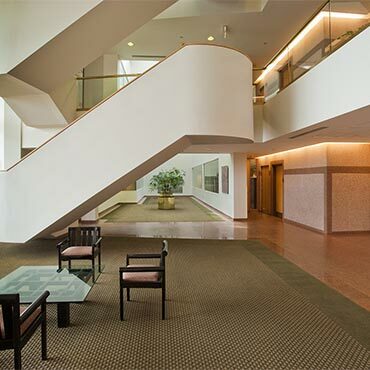 Tufted commercial carpet is produced on machines similar to sewing machines. Several hundred needles stitch hundreds of rows of pile yarn tufts through a backing fabric called the primary backing. The yarn is caught by loopers and held in place for loop-pile carpet or cut by blades for cut-pile carpet. Next, a secondary backing, usually polypropylene, is laminated with latex to the carpet. Other alternatives are attached cushion backings that will add resilience, acoustical insulation, and comfort underfoot. Tufted patterns are now very elaborate and durable. Patterns that were once only achieved through weaving or printing are now achieved through advanced tufting technology. Note: After hours by appointment only.